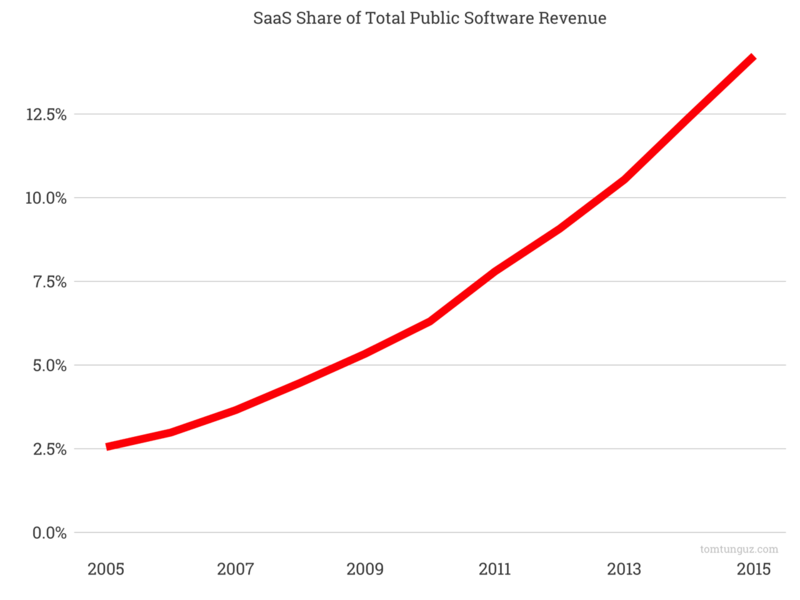 About 15 years since the creation of the first SaaS companies, public SaaS companies account for 14% of total software revenues generated by public companies, a figure growing at about 17% per year. Over the last ten years, the total amount of revenue generated by software companies has tripled from $53B to $169B, meaning SaaS companies are both taking share and growing the market. The growth rate of SaaS revenues follows a geometric growth curve ramping from $1.3B in 2005 to $24B in 2015. However, this revenue growth isn’t a consistent basket. It includes Concur’s revenue from IPO to 2014, when SAP bought Concur. 2015 figures in this chart don’t include Concur’s revenue data, nor from any other take privates, or the SaaS businesses of traditional software companies like Oracle or SAP. In addition, this analysis excludes all private SaaS company revenue, both venture backed and bootstrapped companies. 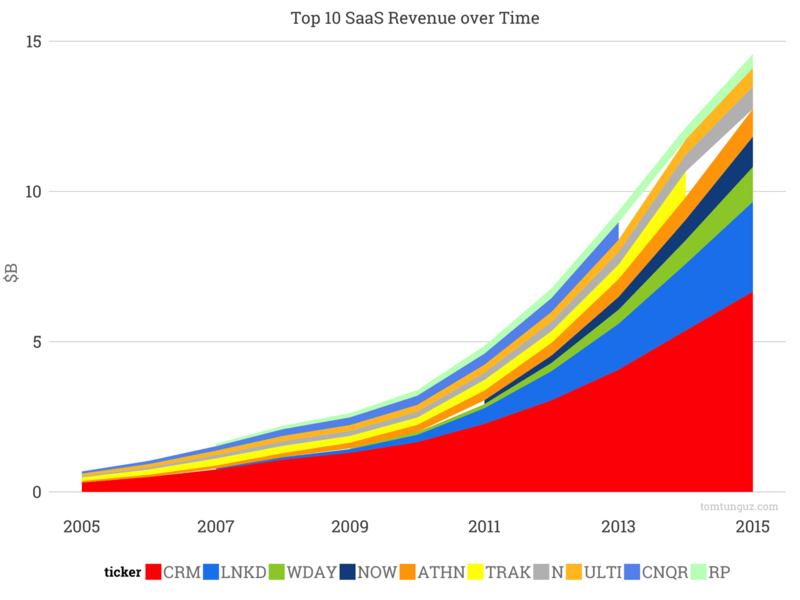 So the analysis actually underestimates the fraction of SaaS revenue today. 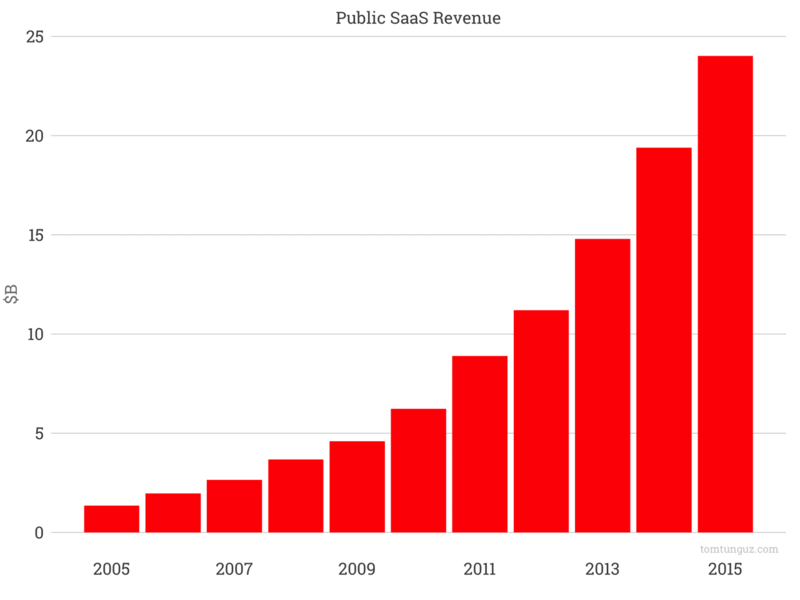 Perhaps SaaS products generated 20-25% of all software revenues, an astoundingly high figure. Examining the top 10 contributors to SaaS revenue, we notice a power law. CRM generates the lion’s share, followed by LinkedIn, Workday, ServiceNow and AthenaHealth. There’s no doubt SaaS has transformed and grown the software industry. We’re likely entering the middle era of SaaS. We have many platform companies built, significant market share shifting, but still quite a bit of opportunity and revenue to seize.